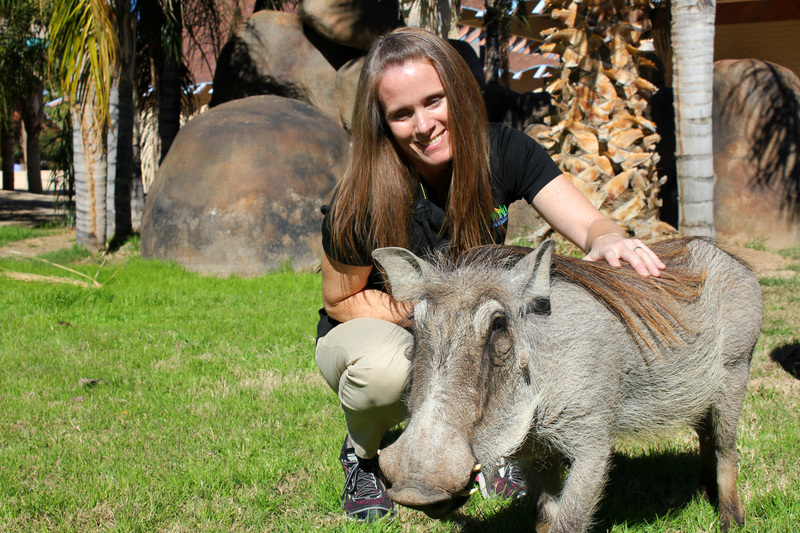 EMCC student Jolene pictured with Zoo ambassador, Waylon the African Warthog. 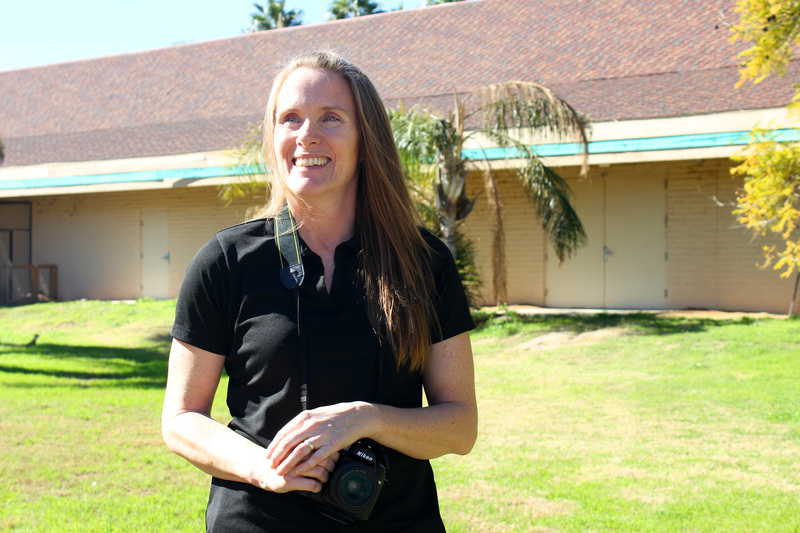 Kristy Morcom, Director of Media Relations for Wildlife World Zoo. Jolene Westerling had no idea what to expect before her internship started on New Year’s Day at the Wildlife World Zoo, Aquarium & Safari Park in Waddell. But from day one, the Estrella Mountain Community College (EMCC) student knew it was going to be something special. Morcom, who is the zoo’s director of media relations and Westerling’s direct supervisor, shares her protégé’s sentiment. Westerling is in her second semester and studying photography. When she enrolled at EMCC, she had ambitions of becoming a portrait photographer, but this internship has already changed that. She said she loves being able to interact with all of the zoo’s various animals, but she has a special place in her heart for Bon Bon, a baby llama. To say Westerling’s responsibilities at the zoo are varied would be an understatement. Morcom said Westerling is also helping with a guidebook to celebrate the zoo’s 35th anniversary, which takes place in September. The guidebook, which will be sold in the gift shop, will contain photos of some of Wildlife World’s animals, along with information on them, as well as historical facts about the zoo and its conservation efforts. “We’re getting some really amazing pictures from her that we’ll be able to include in the book,” Morcom said. Westerling credits Lorenzo Fuentes, aquarist and chief photographer at the zoo, for helping her hone her photography skills. She said Fuentes has helped her better understand depth of field and how to take pictures through a fence without being able to see the chainlink. “I’ve learned a lot from him,” she said, adding he’s also been working with her on the photo imaging programs Lightroom and Photoshop. EMCC has been sending the zoo interns since 2008. In fact, the zoo was one of the college’s first internship partners. Now, more than 100 different internships are available to EMCC students. Internships help students gain professional skills and self-confidence; test out a career field; build their resumes; gather insight into a particular industry or organizational culture; and establish connections and build a network of contacts. Internships typically last one semester but may be extended up to a year. The internship application process is very competitive, said Allie Cervantes, Student Services Specialist, Sr. - Internship Program. “It’s mirrored like a typical job application process,” she said. Cervantes maintains contact with every student throughout his or her internship process. To view a complete list of available internships through EMCC, visit https://www.estrellamountain.edu/students/internships. Students who are interested in participating in an internship are encouraged to email Cervantes at allie.cervantes@estrellamountain.edu or call 623-935-8741.